The family farm has been in my family for many generations. 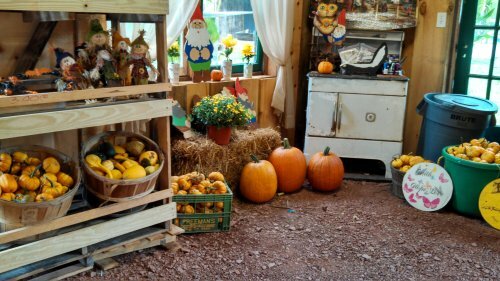 Recently we've reopened it with activities outside and a Harvest Market in the fall in the converted barn. The decor is about as frugal as can be. The shelving units were scavenged from a Tractor Supply store (we think they held plants back in the spring). The bushel baskets, crates, and tubs were found in the barn or borrowed from other family members. The produce in the bins we grew right on the farm. The gnomes and skunk were cut out from scrap plywood by my dad and painted by my grandmother (who also assembled the puzzle in the background). The stove is the actual stove used in the farmhouse back in the day. We moved it to the front of the barn and repainted it to sit in pride of place. Some of the other things were purchased, but the vast majority was scavenged, made, or borrowed by us. An easy country feel with an easy price tag.